Mish's Global Economic Trend Analysis: Ruble Moves 25% Intraday; Bid/Ask Spread at Latvia Currency Exchange Goes Wild; Ruble a Buy? 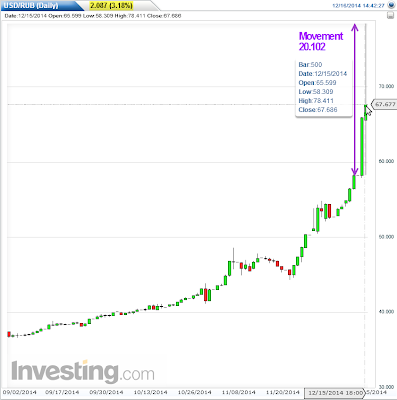 Ruble Moves 25% Intraday; Bid/Ask Spread at Latvia Currency Exchange Goes Wild; Ruble a Buy? 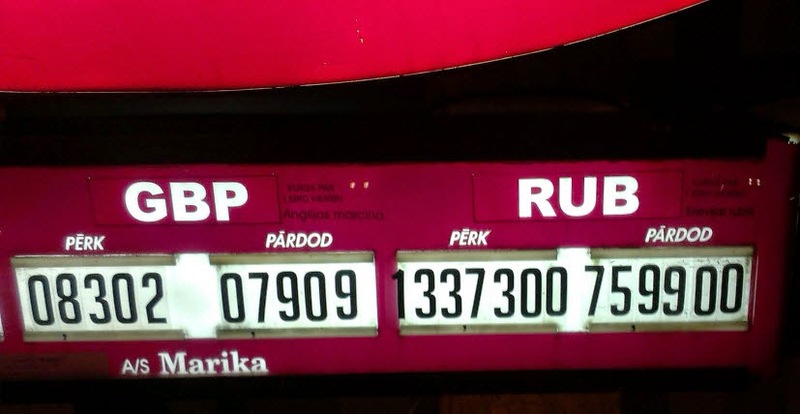 Reader "Luke" from Riga, Latvia emailed an amusing image he took today of exchange rates at the Latvian currency exchange "Marika". 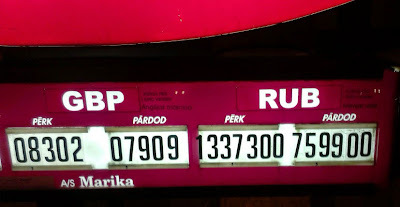 Latvia is on the Euro. The bid/ask spread for euros to British Pounds (GBP) at this particular exchange is a hefty 4.7%. The bid/ask spread for euros to Rubles (RUB) at this particular exchange is an amazing 43%. Needless to say no one was buying rubles at that exchange. If one looked at the open vs. the close the move was only 3.18%. However, the move bottom to top was 25.64%! Thus, wild bid/ask spreads at currency exchanges reflects wild moves in the currency itself. 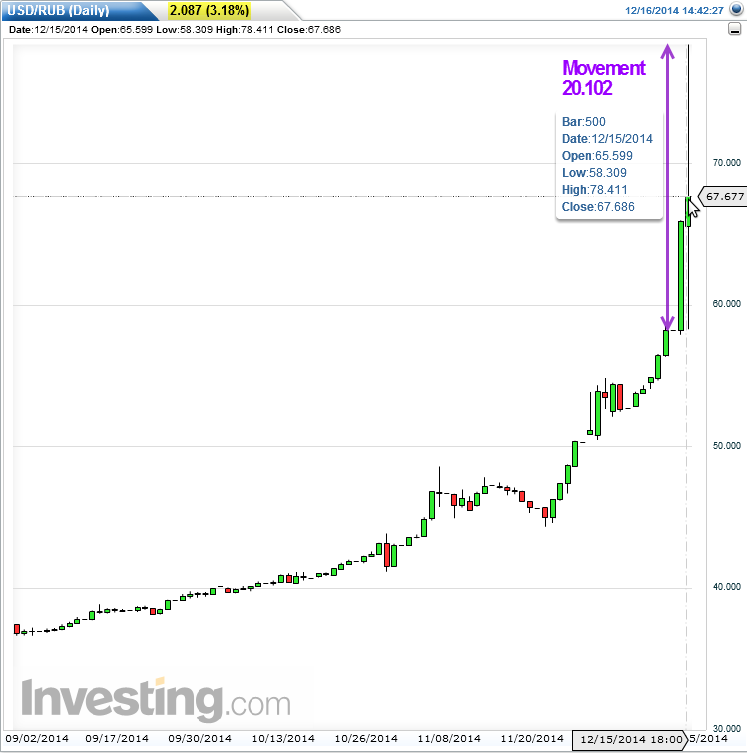 Inquiring minds may be wondering is the Ruble is a buy or if Russian stocks are a buy. I believe they are. So does Pater Tenebrarum at the Acting Man blog - emphasis mine. He took that position earlier today in his post From Ruble to Rubble in a Heartbeat. Does this move make much sense? We actually don’t think so – oil is certainly very important for Russia’s economy, but a recent Study of the Russian Economy concludes that the energy industry actually contributes only 16% to total economic output in Russia. Moreover, Russia’s money supply growth has been slowing quite sharply in recent years (admittedly we are not up-to-date on what has occurred in this respect in the most recent months). It is a good bet that the ruble is by now egregiously undervalued, even in light of the oil price decline and economic sanctions. Russia’s central bank is actually known for being quite conservative. Instituting massive rate hikes in such a situation is certainly a better approach than wasting foreign reserves in market interventions. Hong Kong once hiked rates into triple digit territory for a little while to defend its peg against speculative selling. Obviously, the main objective is simply to increase the cost of carry for traders shorting the currency and at the same time make the currency more attractive to those looking for high yields. It seems rather unlikely that Russia’s economy actually needs base rates between 17 to 18% right now, but as a preemptive measure to cool speculation against the currency, such rate hikes probably make sense. We suspect there will be more central bank moves to come before the situation calms down again – especially as the rate hikes have not had much of an effect yet (that is actually an understatement). Situations like this one very often turn out to have been great opportunities in hindsight. Readers may recall the Russian crisis of 1998 – anyone buying shares and bonds in Russia when the news and the market action were at their very worst made out like a bandit in the end (those brave enough to wade in were eventually rewarded with absolutely stunning gains in this particular case). Of course in a panic sell-off, (or its corollary, a blow-off move), being early by just a few days can be pretty painful in the short run. Nevertheless, this is one of those times when it seems to us that opportunity beckons for those able to stand the risk. There is probably no hurry, we will certainly keep a very close eye on developments. My position is the same. Generally Pater and I are on the same page. See above link for charts on Russia money supply growth and Russia's central bank balance sheet.